In May last year we announced Login with Amazon (LWA), an OAuth 2.0 protocol authentication service that allows your mobile apps for Android and iOS to securely connect with Amazon customers. Today we are making things even easier for customers using apps enabled with Login with Amazon on the latest generation of Kindle Fire devices. Starting today, mobile apps and games that use Login with Amazon on these Kindle Fire devices will no longer need to ask Amazon customers to sign in each time the app is run. Instead, the first time the app is run Login with Amazon will automatically use the account registered to the Kindle Fire device. The user will then simply need to consent to share their information once for each of those apps to be automatically signed in. What Has Changed for Developers? 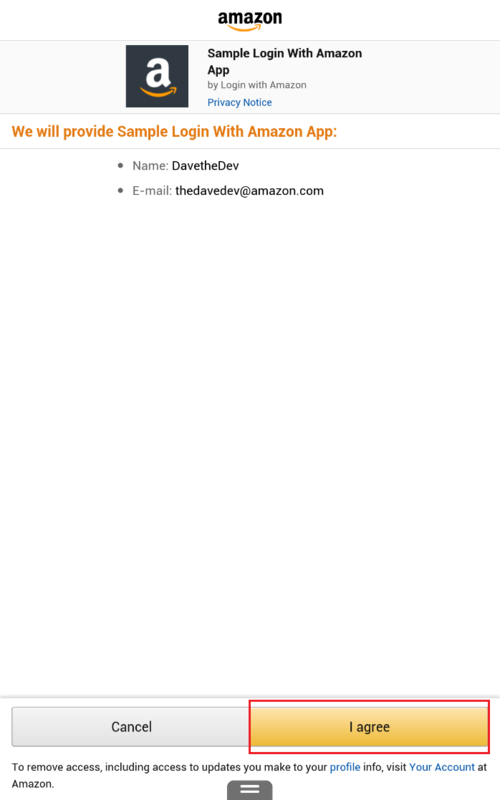 In addition to enabling single sign-on for Kindle Fire, Login with Amazon is now integrated with the Amazon Mobile App SDK with documentation available here in the API section of developer.amazon.com. Login with Amazon is now part of your one-stop destination for all of Amazon’s Mobile App Developer offerings. What Has Changed for Kindle Fire Customers? Mobile Apps and Games downloaded to Kindle Fire devices that have implemented Login with Amazon will no longer need to ask customers to sign in each time. 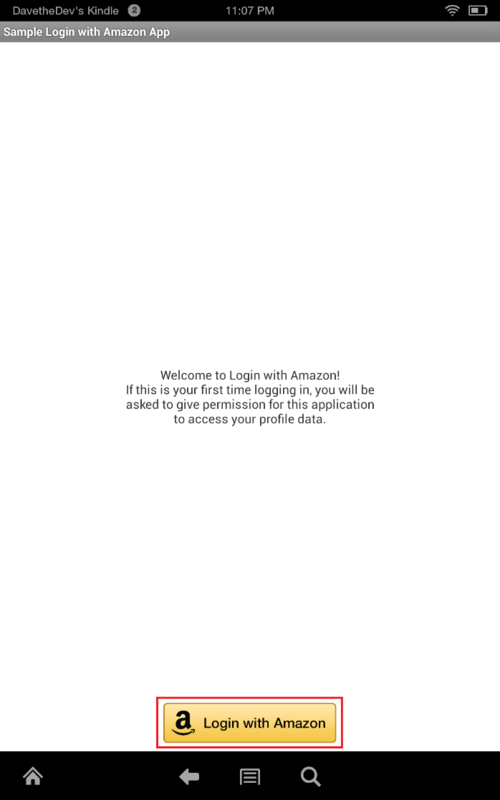 In the below screenshot I launch the Sample Login with Amazon app from the Amazon Mobile App SDK. The Sample App provides a Login with Amazon button for the user to click. Since this is the first time I am logging in with the Sample App I am greeted with a prompt where I agree to consent to share specified information from my Amazon account under the Settings section. Note, I am only prompted the first time I run the app and when I use the app in the future, I will automatically be logged in. To stop logging in automatically, go to Your Account>> Manage Login with Amazon settings and remove the app. What Versions of Kindle Fire Are Supported? To enable Login with Amazon, click on the Login with Amazon tab in the Developer Console to create or select a security profile. 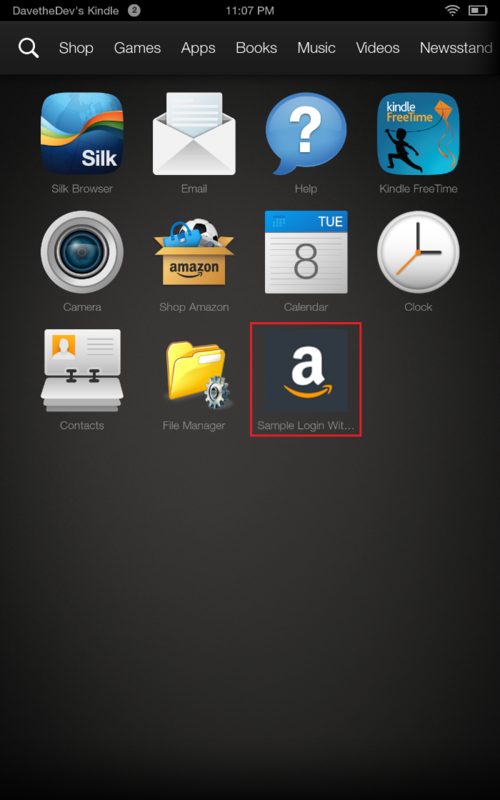 The above Login with Amazon sample app is now included with the Amazon Mobile App SDK. Simply download the latest version and navigate to Android/LoginWithAmazon/samples/SampleLoginWithAmazonApp in the folder where you unzipped the SDK. Learn more about the Login with Amazon API section of developer.amazon.com here. By enabling Login with Amazon on your Mobile Apps and Games for Kindle Fire, you no longer need to ask customers to sign in. This streamlines the experience for your customers and increases engagement for your apps where your customers may have needed to remember their specific login credentials.